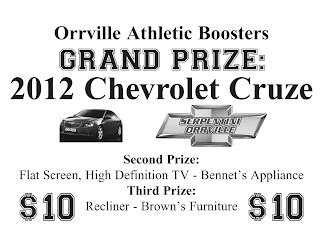 The final push is on for sales of $10 raffle tickets to benefit the Orrville Booster Club. The drawing will be held at halftime of the boys basketball game vs. Wadsworth on February 18th. This is also senior night for winter sports athletes, so there will be plenty going on that night. Just to review, first prize is a red (of course) 2012 Chevrolet Cruze, like the one seen here, courtesy of Serpentini Chevrolet. It was on display during football season and is a very nice car. Second prize is a 46" Flat Screen HDTV from Bennet's Appliance Store and 3rd prize is a recliner courtesy of Brown's Furniture. In speaking to officers of the Booster Club, they're telling me that sales haven't been a swift as they'd have liked and only approximately a few thousand tickets have been sold. It's hard to get a true number of tickets sold since a lot were handed out for folks to sell. The car raffle was done in 2010 and was just sold during football home games. The thought was that extending the sales through the basketball season would increase sales. I think the effect was that there was no sense of urgency to buy a ticket during football season so everyone just put it off, and attendance during basketball season isn't what it is during football season so sales have been slow. One thing is for sure, your odds may never be better to win a 2012 Chevy Cruze or a Flat screen TV or a recliner. These are all Orrville businesses donating in the neighborhood of $20,000 worth of goods to be raffled off in support of Orrville High School athletics. This is something that deserves to be supported or it could go away and with it, a major source of revenue. Funds are always in need for our athletic teams for equipment & uniforms and the Booster Club exists for just that reason...to support ALL athletic teams at OHS. I don't want to say that fans should choose one over another, but maybe instead of buying a 50/50 ticket at the next home game, you consider buying a raffle ticket or two. Inquire about taking a stack & selling them at your place of employment and encourage your friends to buy a ticket. Worry about what you'd do with a new car AFTER you win it. Support the Booster Club first. I'm in for a ticket...who else? To buy a ticket, call or stop in to Crown Investment Services on West High Street and see Tom Brenner or see Kent Smith in the OHS Athletic Department office. Tickets are $10 each. Great weekend to be a Red Rider!! Is Orrville looking to leave the OCC?